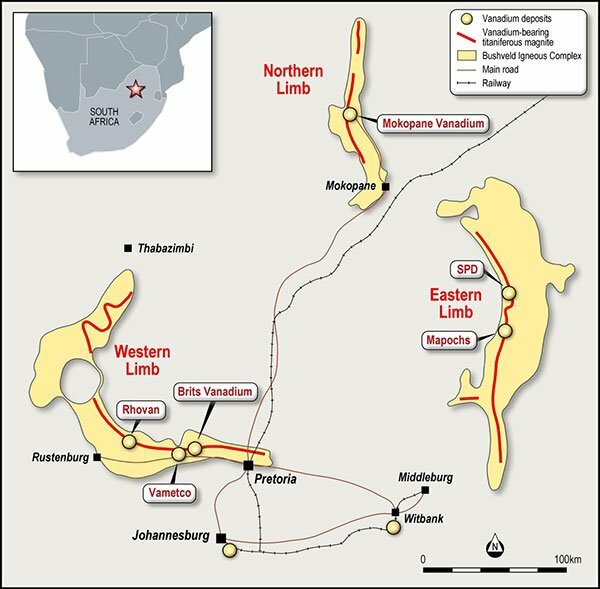 Tando Resources (ASX:TNO) today announced that it is entering the energy metals market, via the acquisition of the SPD Vanadium Project in the established vanadium region of Gauteng, South Africa. TNO will acquire 100% of the issued capital in Steelpoortvan Pty Ltd, which has a right to acquire 74% of Vanadium Resources (Pty) Ltd — the 100% owner of the SPD Vanadium Project. The SPD Vanadium Project is a large, high grade magnetite hosted vanadium deposit. It has numerous RC and diamond drilling results of intersections greater than 1% vanadium oxide with associated titanium mineralisation in magnetite units. In addition, drill samples were run through a Davis Tube to obtain a magnetic concentrate. According to the company, vanadium and titanium content in the concentrate is exceptionally consistent, averaging 2% vanadium and 13% titanium oxide. Based on historic drilling data, a qualifying foreign resource estimate of 513 million tonnes was projected for the SPD Vanadium Project by GEMECS Pty Ltd (below) in accordance with the SAMREC Code (2007). TNO plans to complete a testwork programme at SPD, which will utilise hydrometallurgical processes to extract high purity vanadium and titanium products. 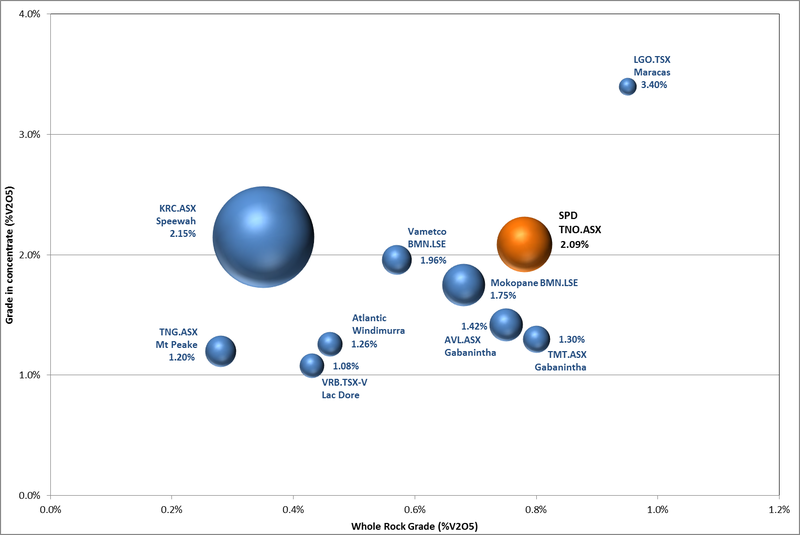 The deal makes TNO one of only a few vanadium stocks on the ASX, while the SPD Project has the potential to be globally significant based on its tonnage and grade in concentrate and compares extremely well to its peers. 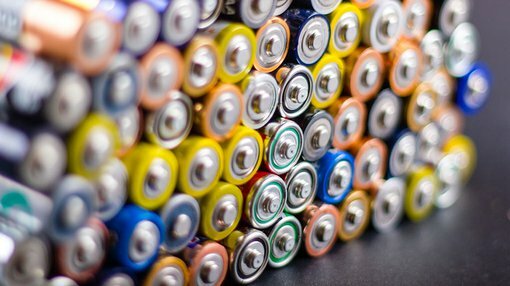 TNO Managing Director Bill Oliver commented on the highly promising acquisition, “We have been interested in gaining exposure to the energy storage market and see vanadium as a key commodity in the development of that sector. “The opportunity to acquire a project of this scale with these grades, both whole rock and more important grade-in-concentrate, was very appealing and we look forward to completing the DD and commencing drilling and other work programmes on the SPD Vanadium Project,” he said. The total consideration is 35 million shares at a deemed price of 30c, subject to shareholder approval and payable when the project reaches certain exploration milestone. TNO will also issue options to the vendors and the advisors involved in the deal. Based off tonnage and grade in concentrate, the SPD Vanadium Project has the potential to become a globally significant vanadium Resource. The project is located in a similar geological setting to the mining operations of Rhovan (Glencore), Vametco (Bushveld Minerals) and Mapochs (International Resources Ltd) in the Gauteng region of South Africa. The SPD Vanadium Project was discovered in the 1990s during a regional exploration campaign to find new supply for active vanadium operations. Initial exploration at the site consisted of six diamond core drill holes for 1051.6m as well as in-depth geological mapping.